The city is now Europe's largest technology cluster. About 57,000 people are employed by more than 1,500 technology-based firms in the area. 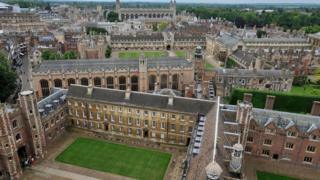 John Bridge, chief executive of Cambridge's chamber of commerce, said it would make the university more accessible to students and enable them to "develop skills to climb career ladders". "The term 'apprenticeship' itself is outdated, but it is important that young people know there are different options out there," he added.